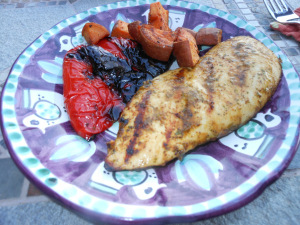 Here’s another great marinade for chicken on the grill. Perfect summer meal. Just a little different than the ho-hum marinades. If you love cilantro this one’s for you. Enjoy! Here’s a delicious chicken dish made with lime instead of the usual lemon. It has a nice little kick from the chili powder, and I just adore fresh cilantro. Now I know a lot of you are shaking your heads saying ‘ugh cilantro’, and quite honestly if you’re that cilantro hater this probably isn’t the dish for you. If you are a cilantro lover as I am, then go for it. It’s fresh and savory and super easy to make. I also love when you can combine all the ingredients in the food processor, as it makes for such an easy time. Also , Joel just loved it…who knew he’d like cilantro so much?? ?